Much has been written within the tradition of drama education and applied theatre around the premise that drama can be a force for change within both individual lives and society more broadly. However, little has been published in terms of charting the nature of this relationship. By combining theoretical, historical and practical perspectives, this book unpacks and explores drama’s intrinsically entwined relationship with society more comprehensively and critically. 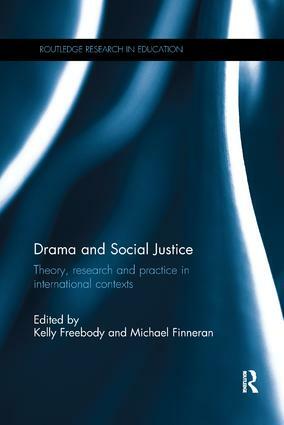 Chapters gather together and develop a range of theoretical understandings of social justice in applied drama in the first part of the book, which are then used to frame and inform more focused discussions of drama research and practice in the second. Contributors move beyond practical understandings of drama for empowerment or development in order to engage with the philosophy of praxis – the interconnected and symbiotic nature of theory derived from practice, and practice derived from theory. Including concrete examples from current research and practice in the field, the book opens up a conversation on and counter-narrative to perceptions of the nature and impact of applied theatre and drama education on social justice. Drama and Social Justice will be key reading for postgraduate students, academics, researchers and field-based practitioners in the areas of applied drama and theatre, education and youth work, and social justice and the social sciences.